The global fragrances market is indicative of innovation due to a large number of market players executing products with a widely creative knack. Owing to this differentiated approach endorsed by each market player, the market is expected to remain moderately competitive. The packaging and appearance of the products have been at the forefront to give a distinctive appeal to products, and a large number of huge players have resorted to this strategy. Besides this, the various market players are also expected to adhere to environment-friendly packaging standards that is amongst the top-notch strategies that could distinguish market players from their competitors. The key market players have also been on the lookout to penetrate the markets within emerging economies, thus, giving them an edge over competitors. The prominent market players in the global market for fragrance packaging include Quadpack Ltd, Continental Bottle Co. Limited, Premi Spa, Alcion Plasticos, Albea S.A., Verescence France SASU, Saverglass sas, Coverpla S.A., Glaspray Engineering & Manufacturing Co. Ltd., CCL Container (Hermitage) Inc., Swallowfield Plc, Intrapac International Corporation, General Converting Inc., Gerresheimer AG, and EXAL Corporation amongst others. 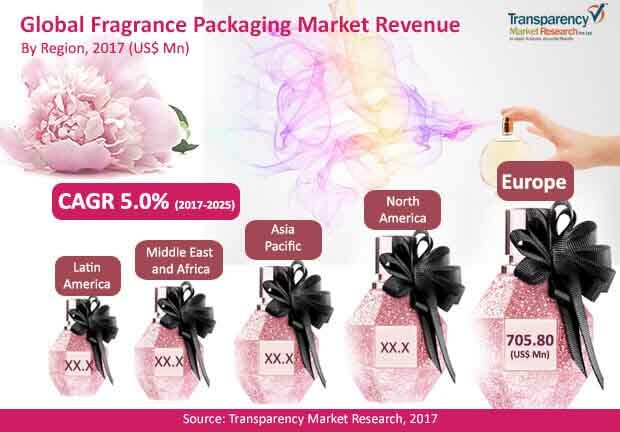 TMR’s recent report analyzes the global interplay of market forces contributing to the growth of the market for fragrance packaging. The report estimates that the global market for fragrance packaging is expected to be valued at US$2,119.9 mn towards the end of 2025 as compared to a figure of US$2,031.9 mn in 2016, while registering a CAGR of 5.0% over the forecast period from 2017-2025. Amongst the various types of materials used for packaging fragrance deodorants and perfumes, metals occupy a 40% of total market share amongst all other types of packaging. On a geographical footing, Europe is expected to be the leading regional market registering a CAGR of 3.9% over the forecast period. This could be attributed to the ravishing lifestyle and fashion needs across the European nations. In recent times there have been rigorous campaigns to establish and emphasize the vitality of personal grooming, which has virtually made self-care and enhancement a part of human physiology. Moreover, the expanse of the world wide web and availability of the internet across densely placed regions has capture the essence of people’s lifestyle. The psyche of the masses has inclined towards grooming products especially perfumes, which has bolstered the demand in the market for better packaged perfumes. The e-commerce industry has made it possible for people to place their orders online and receive them at the earliest. Since, the packaging of the products is an important parameter to persuade the consumer into buying the product, there is increased impetus on the packaging of fragrances. The environmental concerns that have seeped into the minds of the consumers are discouraging them from buying perfumes with non-biodegradable packaging. The awareness about the ill effects of plastic, glass, and metal on the vicinity could be a major hindrance for the market for fragrance packaging. Raw materials used for packaging undergo frequent changes in pricing which further aggravates the market’s fettle. However, there is more hope than despair in the market because the well-off customers still buy fragrances in high volumes. Moreover, as the grooming and fashion industry propels, the need for pomp fragrances and showy packaging would keep the market for fragrance packaging soaring high.